Outboard Roller Chains are Free Flow Chains with longer pins than Double Pitch or RS Chains and freely rotating outboard rollers attached. Refer to the table below for combinations of outboard rollers and base chain rollers. 1. For the sake of convenience, the base chain is the part of the chain with the outboard rollers removed. 2. *1 Steel outboard rollers require additional lubrication, even if the base chain is Lambda Chain. 3. *2 Only the pin attaching the outboard rollers to the chain is precipitation hardened stainless steel. 4. Brakes used with electroconductive rollers and when the base chain is NP Series are spring brakes. 5. Base chain rollers are S-rollers when KV Series outboard rollers are used. We offer steel rollers (S- and R-rollers) and plastic R-rollers for the base chain. 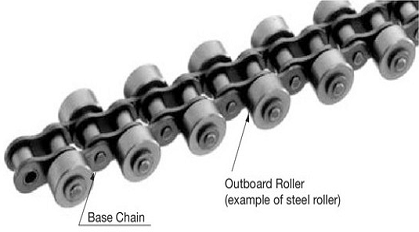 RS Chain uses steel rollers, while Double Pitch Chain can use steel or plastic R-rollers. ・ All parts are steel that has been heat treated for hardness. Note: Only available up to RF2060. Available with stainless steel R- and S-rollers or plastic R-rollers. S-rollers for RS Chain and Double Pitch Chain use steel rollers, while R-rollers for Double Pitch Chain use both steel and plastic rollers. 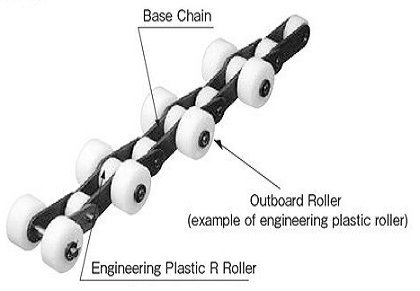 ・ The R-roller of the base chain is engineering plastic, while the pins are precipitation hardened stainless steel. 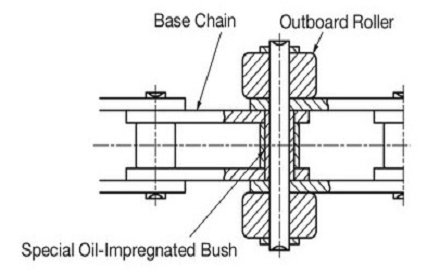 Chains with outboard rollers are shipped in unit lengths (length of one chain) unless otherwise specified. ・ Braking performance ensured thanks to special engineering plastic with a large coefficient of friction. Enables quick start ups. ※ Only available up to RF2060. ・ Provides excellent heat, chemical, and flammability resistance, conforms to food sanitation laws. The diagram shows an example of outboard rollers attached every link in a staggered pattern. Plastic brake rollers used when rollers are attached in a staggered pattern every link are normally attached every three links (as per the diagonal line in the diagram). 2. When attached in a crosswise pattern. The diagram shows an example of outboard rollers attached every two links in a crosswise pattern. When the base chain is an RF chain, outboard rollers can be attached every link (every two links for RS chain). Plastic brake rollers used when rollers are attached in a crosswise pattern every two links are normally attached every six links (as per the diagonal line in the diagram). All Double Pitch Chain with outboard rollers can use sprockets for Double Pitch Chain. When using RS sprockets, only S-rollers can be used, and the sprocket must have 30T or more. RS sprockets with small numbers of teeth (the gray shaded area below) cannot be used with outboard rollers because they contact the hub. When using RS sprockets with small numbers of teeth, finish the hub diameter as per the chart below, or use as is with larger numbers of teeth.